This listing is for a custom baby blanket for your sweet baby boy. The scalloped edges of the quilt add a sweet detail, and the navy color of the monogram make this quilt extra adorable! 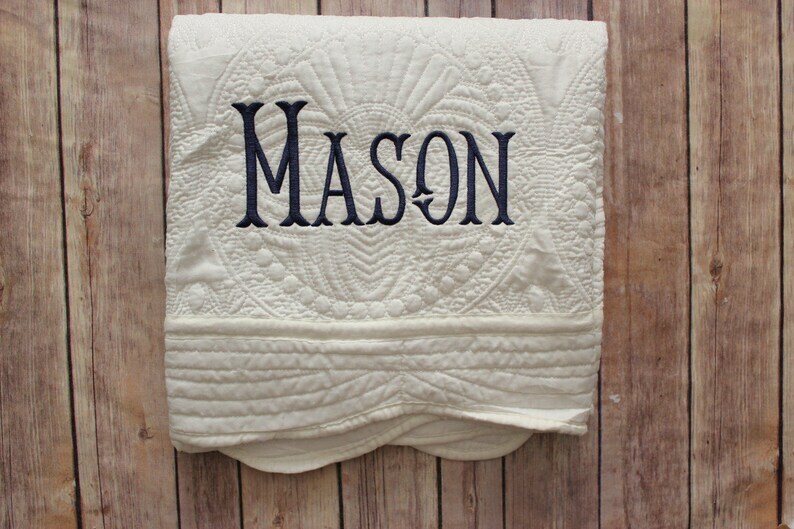 This blanket comes with the three letter monogram or full name monogram in the fishtail font (shown in the first picture) unless you specify something different. The colors of the quilt and the monogram can be changed to match your nursery decor! Blankets are 100% cotton and measure 36x46 inches. This was a new baby gift. The parents absolutely loved it. I can hardly wait to give to my grandson! Beautiful and perfect.